Home Blog Advice for hoofboots Fit Kit Glove Back country . How to choose? 1. 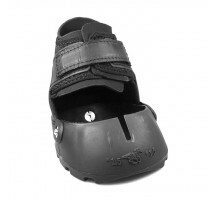 The perfect boot size can be pushed on the hoof, but it should take a bit of effort. You should feel the shell flex as it goes over the hoof. 3. Ideally, the V at the front of the shell should expand as seen in the photo. 4. It should be very difficult to fit a hoof pick between the shell and the hoof. 5. The hairline at the heel of the horse should be no more than 1/2 an inch above the shell. Keep in mind that if the shell fits over or close to the rear hairline, you can always trim your boots down. Please do not trim the Fit Kit boots. 6. The boot should fit snug and will be difficult to pull off the hoof. 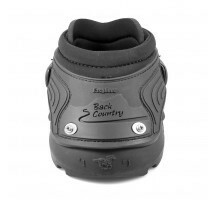 A good fit will give you the impression that the shell will stay on the foot without glue or without a gaiter. It should fit like a glove.